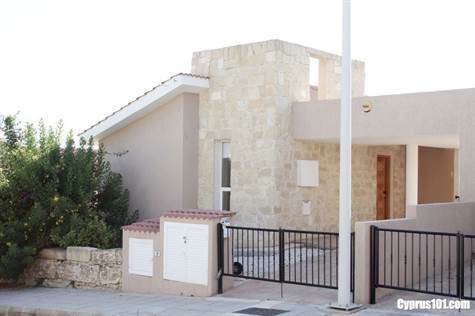 Tala, Paphos – This spacious 3 bedroom detached villa is located in a quiet residential cul-de-sac in the popular village of Tala. The traditional village square with its many quaint tavernas and restaurants is within walking distance and there are many local shops and amenities. It is an ideal location for families with children as the International School of Paphos is a 10 minute drive away. The property sits on a hillside with spectacular views of the countryside and coastline. To the front is a gated driveway with covered parking. The main residence features a light and airy open plan lounge, dining area, corner kitchen and guest toilet. Patio doors open on to a spacious balcony with impressive views of the countryside and coast. The fully fitted kitchen is well equipped with granite worktops, breakfast bar, built in oven, electric hob, extractor and dishwasher. Tiled stairs lead down to the lower level accommodation which includes three double bedrooms all with fitted wardrobes and direct access to the pool and gardens via patio windows. The master bedroom has an en-suite shower room and there is a family size bathroom accessed directly from the hallway. A large fitted cupboard provides a great utility space and/or storage room. The garden area is designed with low maintenance in mind and a covered veranda to the side of the swimming pool makes a perfect space for a comfortable seating area and outdoor dining. The property is ideal as a permanent residence or holiday home.